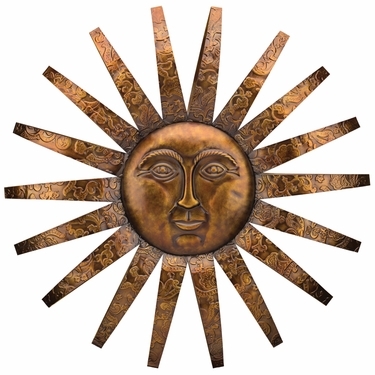 Our Sedona Sun Wall Decor features an iconic sun face with an intricate pattern imprinted on the sun's rays. Beautifully crafted with sturdy metal, the rays effects are truly a showstopper. Powder-coated to provide weather resistance, this attractive piece can be used indoor or outdoor. Size: 2.75" x 33.5" Diameter, 5.25 lbs.